As with many things, the adage "if you build it, they will come" holds truth. 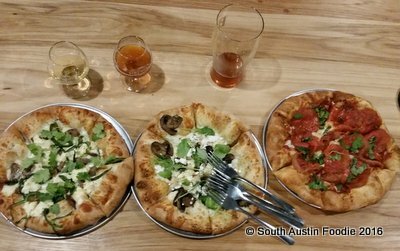 The new Pinthouse Pizza on South Lamar in the Brodie Oaks shopping center is certainly no exception. It's sister location on Burnet Road has always been well-liked by friends, but I have never made it there myself. 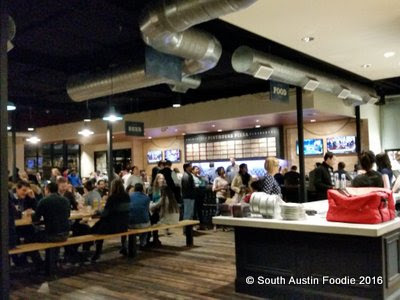 This brew pub/pizza joint opened in South Austin in late October, and when I went the beginning of December, it was packed. Five of us decided to meet there on the first Thursday in December. I was the last to arrive at just after 6 pm, and I walked into a buzzing hive. 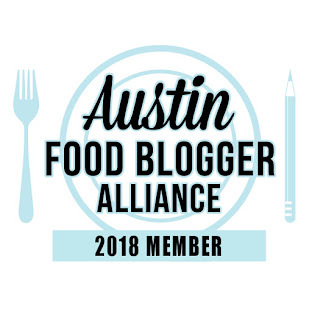 Fortunately, my friends already had a table (or, a spot within the bank of picnic tables), AND one of them had been there before, so she knew how it worked. And thus, here lies my rub with Pinthouse: there's no host/hostess, so it's up to you to stumble in and figure it out for yourself. There are two separate lines you will have to get in, one for beer and one for food. Or maybe you only want one, and not the other, which will save you time. My friends had already ordered this flight of beers when I arrived; I liked the holder and the chalkboard for names. 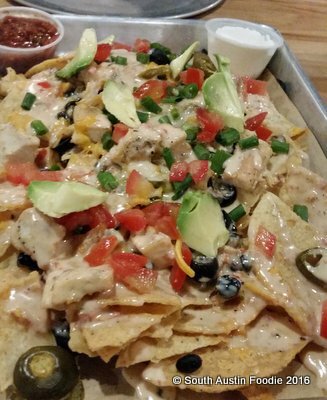 We were ogling our neighbors nacho tray, and they gave it high marks, so we started with that. Very tasty queso and nice thick tortilla chips, and I think a decent quantity for just under $8. 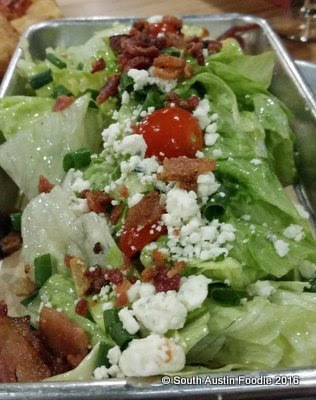 The wedge salad was a disappointment, as the blue cheese vinaigrette was very weak in flavor, as it really lacked the promised blue cheese. It just tasted like an oil and vinegar dressing. But it was very fresh iceberg lettuce. We got three 10" pizzas so we could try a variety. So they're not quite Neapolitan-style pizzas, but they are a thicker, doughier crust. They come in 10", 14", and 16" sizes. Three small pizzas plus the nachos and salad were perfect for five people. 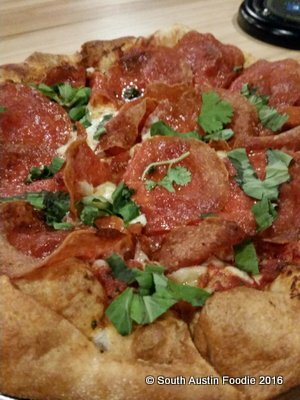 The pepperoni and basil turned out to be my favorite; the meat was sliced really thin, so it was a bit crispy around the edges and not at all greasy, plus there wasn't too much tomato sauce (I am not a fan of heavy tomato sauce on a pizza). 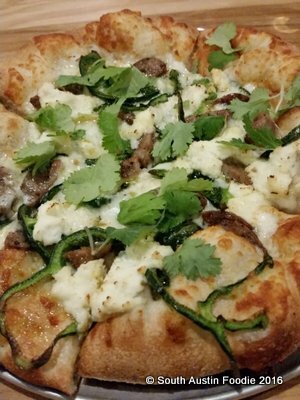 The Armadillo pizza with sausage, poblano, ricotta, and cilantro. I love a white pie, but this didn't do it for me. In my book, it really really needs a drizzle of a balsamic reduction or some other acidity on it to really make it stand out. Fresh and good quality ingredients? Yes. Great tasting pizza? No. 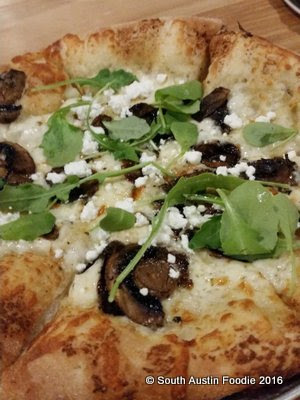 And this other white pizza, with mushrooms and arugula; I think this was a build your own option, I can't remember and someone else did the ordering. This too suffered from lack of acid, whether it's balsamic or tomato sauce or fig jam. Overall is their pizza good? Yes, but just not as good as it could be to my discerning palate. 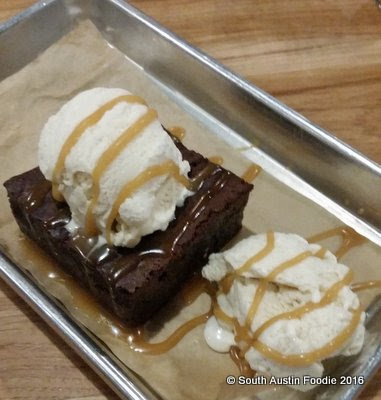 But hands down, the best thing we had was the chocolate fudge brownie with Amy's ice cream. So rich! And smooth, and really chocolaty. And when split five ways, even better! I was real glad to have a "veteran" with us, who knew how the system worked, as walking into a new place for the first time can be a tad overwhelming when the place is packed. And a beer and pizza joint with ample parking is sorely needed in this area. They are really good about updating their Facebook page regularly, and I see that a house-brewed "Hefewhyzen" will be tapped later this month (one of my favorite beer varieties). Plus the January pizza of the month is a Thai peanut chicken, which I know won't appeal to everyone, but it does to me! Now I feel that I can enter Pinthouse with confidence, as I at least know how the system works. If my one weeknight experience is any indication, they have no trouble attracting business. 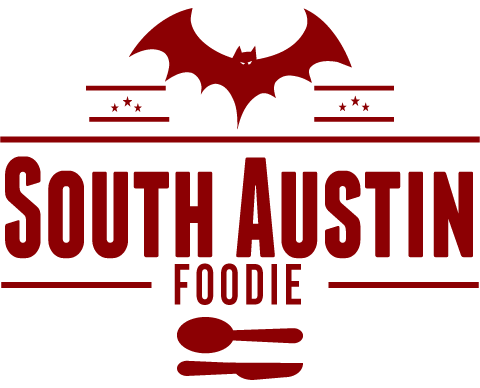 Nice write-up! One tip, while you can only order food from the registers in front of the kitchen, you can actually order both beer and food from the bar. Cheers!